NORMAN, Okla. — A jury has recommended the death penalty for a Muslim man who beheaded his coworker three years ago and attempted to decapitate a second woman. The 12-person jury took approximately three hours to determine that Alton Nolen, 33, was eligible for capital punishment. Nolen had been found guilty last month of first-degree murder, as well as four counts of assault with a dangerous weapon and one count of assault and battery with a deadly weapon. His attorneys entered an insanity plea, but it was rejected by the jury. Some psychiatrists had testified during the two-week trial that Nolen was mentally ill, while others stated that he acted with full knowledge that his behavior was wrong. “He did not know what he was doing was wrong. Actually, he thought what he was doing was right. Nolen is delusional in his beliefs,” defense attorney Shea Smith told jurors, according to the Norman Transcript. “This was a decisive act not driven by a mental illness. I submit to you he would do it again in a heartbeat,” Cleveland County Assistant District Attorney Susan Caswell contrarily argued. Recorded audio of the 2014 police questioning of Nolen was also played for jurors, during which he expressed no remorse and said that he was only doing what he believed Allah wanted. Nolen told police that he acted out because he felt he was being treated differently by his coworkers since he is a follower of Islam. As previously reported, in Sept. 2014, days following his suspension from Vaughan Foods over alleged comments about Caucasians, Nolen entered the front office, where he encountered Colleen Huffort and began attacking her with a knife. “He did kill Colleen and did sever her head,” police spokesperson Jeremy Lewis stated in a press release following the incident. Nolen then began attacking coworker Traci Johnson, who caught the attention of others in the building with her screaming. One of those who heard Johnson’s cries for help was Chief Operating Officer Mark Vaughn, who also served as an Oklahoma county reserve deputy. Being armed at the time, he shot Nolen, saving Johnson’s life. Others in the building locked themselves in their offices and called 911. Police arrived on the scene minutes later. Nolen had reportedly asked to plead guilty and be executed last year, but his request was refused by presiding judge Lori Walkley. Attorneys instead entered an insanity plea on his behalf. Kelli Beranek, the daughter of victim Colleen Hufford, provided a victim impact statement on Wednesday as the case entered the sentencing phase. In addition to recommending the death penalty for killing Hufford, jurors handed down three life sentences surrounding the assault charges. 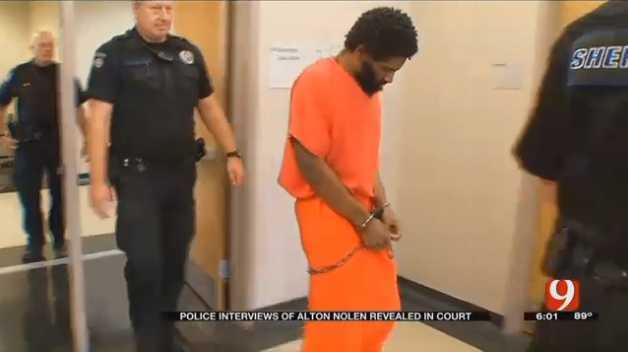 Nolen will be formally sentenced on Dec. 15 and an automatic appeal will commence.